Superb hotel a few minutes from the Kremlin, it couldn't be more convenient. There are three metro stations nEarby as well. Great location, nice staff, clean room. Would definitely return. Incredible We loved staying here - it was perfect in every way... friendly and efficient staff, beautiful interior, amazing views from the rooftop bar, wonderful location. I especially loved gazing out over the Bolshoi from the pool. One tip: pop into the perfume shop for an extraordinary experience! Zimmer war sehr ruhig. Die Lage im Zentrum und in der Nähe der U-Bahn Station ist super! Wi Fi ist sehr schwach, schade. Frühstück fanden wir zu teuer. Wonderfull time in Moscow centre We are very satisfied on service in this historical hotel, I can only recommend this hotel . Sehr schönes und zentral gelegenes Hotel. Freundlicher Service, tolles Zimmer und Frühstücksbuffet. solo traveler Location superb. Hotel staff very friendly and helpful. Room and bathroom very tidy and clean. I left the hotel with very good impressions. Loistava hotelli hyvällä sijainnilla! Hotelli oli kuvien mukaisessa kunnossa ja kaikki oli todella siistiä ja hotellinhenkilökunta todella ystävällistä ja avuliasta. Suosittelen ehdottomasti tätä hotellia kaikille! 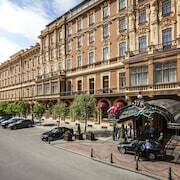 There are so many places to stay in Russia that it can be tricky to whittle things down. 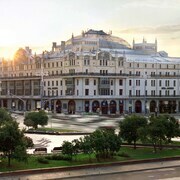 This is where ebookers comes in: we can show you the best hotels in Russia in a matter of moments. You’ll be able to see all the hotels on a detailed map, so you can check how close they are to various landmarks. In fact, you can specifically search for hotels that are close to specific attractions, as well as filtering your search for lavish, high-end hotels or comfortable, cost-effective accommodation. Our informative hotel descriptions, which include photos of the various pads and details on rooms and amenities, will help you make the right decision for your getaway. 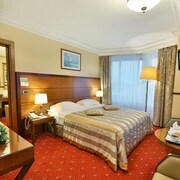 Whether you’re coming from near or far, you can make use of ebookers to organise your journey to your hotel in Russia. Searching for flights to Russia will instantly show which airlines and routes are available for your chosen travel schedule. You can then look up our car hire deals and arrange to have a vehicle waiting for you when you arrive, so you can go seamlessly from the airport to your hotel. Having your own wheels will also make it easy to travel around and visit more remote towns and villages, as well as rustic restaurants that might be out in the rural areas. You have a whole, exciting country to explore, after all. Let’s face it, one of the joys of being on holiday is doing as little as possible. Even just lounging around your hotel is an activity in itself. Of course, there’s so much to see in Russia, and if you’d like some inspiration then check out our Things to Do tool. This will lay out the attractions and major sights around your Russia hotel, so whether you’re just looking to wander and sightsee, or explore cultural attractions and places to take the whole family, ebookers will have you covered.